Save yourselves the time and efforts of putting the new flat-pack together alone. Call the professionals. We have been delivering first class furniture assembly Whetstone N20 for a long time and have many regular customers. No matter if you need a bed, wardrobe, desk or table assembled, we have the know-how and expertise to do it. The team members have put together many different furniture, produced by the big retailers, always delivering great results, at bargain prices. We value your time and to make it easier for you to order an assembly service, we offer many booking opportunities. Order assembly of IKEA furniture with us every day of the week - take advantage of our flexible scheduling options and the oportunaty for a same day service. You will not have to wait around for the team to get to your home, as we will be there at the time you chose. Plus, we can offer you special deals when you book a few of our services together. Next time you buy a flat-pack, have our furniture delivery team transport it to your door, right before the assembly team turns the flat-pack into a nice piece of furniture. 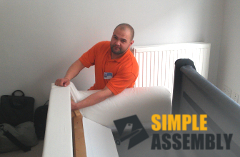 Call 020 3404 5905 now to schedule our expert and efficient furniture assembly service in Whetstone! You will be provided with a free quote that comes with no obligations. Or if you prefer, you can contact us directly via the live chat on this website. Another way to enquire about our services is to fill in the online booking form. One of our call centre operators will contact you back shortly, ready to answer all your questions and help you with the booking.